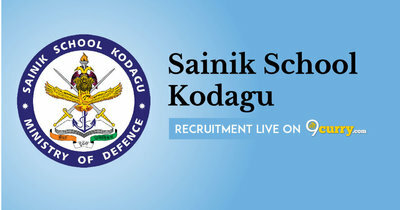 Sainik School Kodagu Recruitment 2019 - Job notification for TGT, Counsellor & Other Posts in Sainik School Kodagu, Kodagu, Karnataka on Contract Basis. Applications are invited by Sainik School, Kodagu on or before 04 May 2019 for 9 vacancies. Graduate in/with the subject, with a recognized Degree / Diploma in Education (OR) BA.B.Ed with English of the Regional College of Education and Qualification Certificate of CTET/TET conducted by Central Govt./State Govt. to be submitted. Graduate in/with the subjects Hindi with a recognized Degree / Diploma in Education (OR) B.A.Ed with Hindi of the Regional College of Education and Qualification Certificate of CTET/TET conducted by Central Govt./State Govt. to be submitted. 01 (a) Matriculation or equivalent (b) Three years experience as Horse Riding Instructor in Race Course Club / Educational Institutions (OR) ExServicemen from Indian Armed Forces / Central or State Police Service with relevant training experience. Eligible candidates may send their application in prescribed format (attached below) to The Principal, Sainik School Kodagu, PO:Kudige, Somwarpet Taluk, Dist. Kodagu, Karnataka, PIN – 571 232 on or before 04 May 2019, along with Copies of educational and experience certificates.